Earlier we have covered a news saying the Nokia X2 Phones will be available on Indian markets soon, Nokia X2 could be launched really soon in India. Now Microsoft decided to concentrate more on Windows Phones, so will discontinue the future Nokia X line of products. 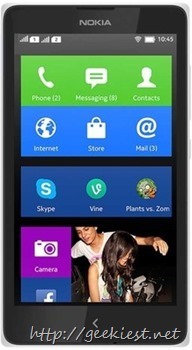 The CEO of Microsoft Satya Nadella said they will be converting the Nokia X series of phones to Windows phones. We are working to integrate the Nokia Devices and Services teams into Microsoft. We will realize the synergies to which we committed when we announced the acquisition last September. The first-party phone portfolio will align to Microsoft’s strategic direction. To win in the higher price tiers, we will focus on breakthrough innovation that expresses and enlivens Microsoft’s digital work and digital life experiences. In addition, we plan to shift select Nokia X product designs to become Lumia products running Windows. This builds on our success in the affordable smartphone space and aligns with our focus on Windows Universal Apps. This was expected when Microsoft acquired the phone manufacturing division. The Nokia Asha and Series 40 feature-phone series also stopped soon. Microsoft may be trying to produce cheaper Windows phones as the competitor Android have so many cheaper option compared to the Windows Phones. Another news says Microsoft will cut down its 18,000 employees around the world and most of them will be from Nokia.